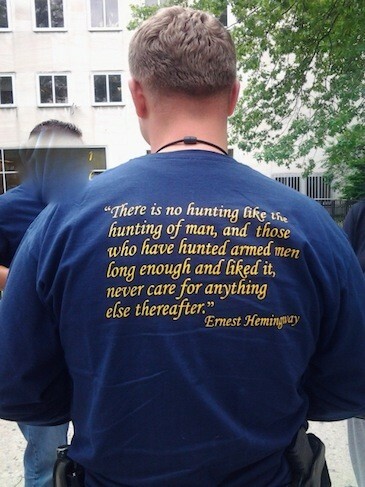 Radley Balko has an article up on HuffPo about what cop T-shirts say about cop culture. This exemplifies the us-against-them mentality that permeates law enforcement at all levels in the U.S. Instead of serving and protecting, people have become the enemy. Add to that the fact that cops are rarely even disciplined for breaking the same laws they enforce against ordinary citizens with such zeal and it becomes pretty obvious that law enforcement, and government in general, have become a privileged class in America. Go read Radley’s article and look at all the other pictures. This entry was posted in Drug War, Justice System Abuse of Power, Links to theagitator, Polce Militarization, Police Misconduct, Police State, The Land of the Free on June 21, 2013 by Dave Krueger.